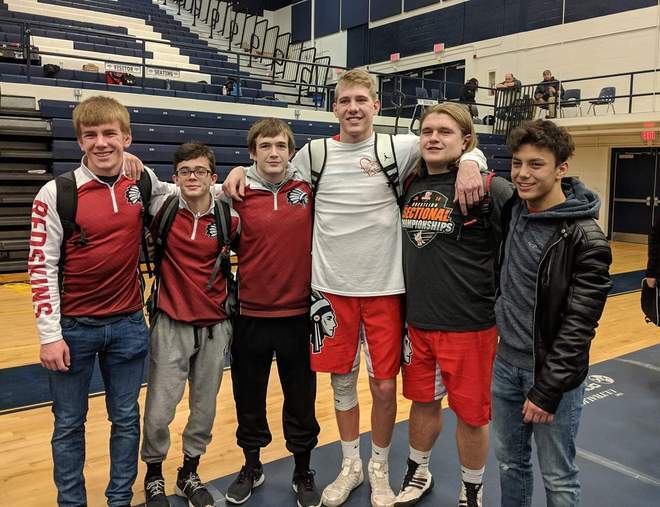 Napoleon, OH- The Wapakoneta Wrestling Team advanced six Wrestlers to next weekend's District Tournament at Norwalk after fininshing in 3rd place as a Team at the Napoleon Sectional. The top 4 in each weight class at the District will advance to the State Tournament March 7-9 at Ohio State's Schottenstein Center. The Redskins finished the tournament behind Champion Wauseon ans Runner-up Napoleon. dvancing of for Wapakoneta are Sophomore Jacob Schlesselman (152lbs) and Junior Keaton Elling (126lbs) who both finished in fourth place, Sophomore Colin Mellott (106lbs) and Senior Luke Beach (138lbs) who both finished in second place, and Seniors Dylan Plaugher (195lbs) and Brennen Knueve (285lbs) who both finished as Sectional Champions. Rounding out the placer for Wapak were Freshmen Gavin Hall (120lbs) and Cael Rostorfer (220lbs) as well as Sophomore Bryce Knapke (113lbs) who all finished in sixth place.